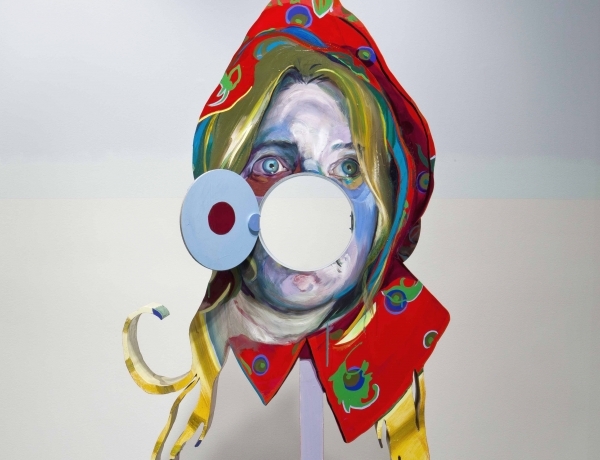 Natalie Frank, Figure I (Hinged), 2014, Oil and oil enamel on panel with hinges, 95 x 75 inches. Rhona Hoffman Gallery is pleased to present Interiors and Openings, the first solo exhibition with New York-­‐based painter Natalie Frank. Frank’s family of larger-­‐than-­‐life paintings on shaped, wooden panels inhabits an expansive landscape, demarcated by a horizon line and sky on the gallery walls. These figures recede and protrude in a fictional space. Rectangular paintings and works on paper punctuate the environment, bringing the figures back to an interior setting. Hinged appendages and moving parts reveal hidden layers and transform figures into hybrid creatures that are both painting and sculpture, introverted and extraverted. An enchanted realm situated between figuration and abstraction emerges under Frank’s deft hand. Natalie Frank’s work has been recognized for its strong figuration, confident brushwork, and brilliant color. In Interiors and Openings she asserts her distinct voice as a painter, exploring liminal spaces of self, sexuality, and family, for the first time in three dimensions. Natalie Frank (b. 1980, Austin, Texas) received her M.F.A. in visual arts from Columbia University in 2006 and her B.A. from Yale University in 2002. She was a Fulbright Scholar at the National Academy of Fine Art in Oslo, Norway in 2003-­‐04. Frank also studied at the École des Beaux Arts in 2001 and the Slade School in London in 1997‐99. Her first museum show, Natalie Frank: The Brothers Grimm will contain a selection of 75 pastel and gouache drawings based on the original, unsanitized Grimm’s Fairy Tales. Organized by The Drawing Center, New York (April 10 – June 28, 2015), Brothers Grimm travels to The Blanton Museum of Art, Austin, Texas (July 11 – November 15, 2015). The exhibitions are accompanied by a book published by Damiani and distributed by DAP, with essays by Linda Nochlin, Claire Gilman, Julie Taymor and an introduction by Jack Zipes.